Legendary band will be joined by Joan Jett, Sheryl Crow and others at select dates. 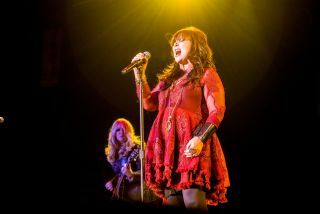 Heart have announced a summer U.S. tour, “Love Alive,” their first outing in three years. The 39-city jaunt kicks off Tuesday, July 9 at the Hollywood Casino Amphitheatre in St. Louis, MO and wraps September 9 at the Hollywood Bowl in Los Angeles. The band will be joined at select stops by Joan Jett & the Blackhearts, Sheryl Crow and Brandi Carlile. Along appearing are Elle King and Lucie Silvas. Said Heart guitarist and singer Nancy Wilson, “I think this year is a good year to show the collective impact of some powerful women in music. We would usually steer clear of the female-centric concept, but in the light of current events it seems like the right statement at the right time." Tickets go on sale to the general public beginning Friday, February 15 at 10:00 AM local time at LiveNation.com. Additionally, Citi cardmembers will have access to purchase pre-sale tickets beginning Wednesday, February 13 at 10:00 AM local time until Thursday, February 14 at 10:00 PM local time through Citi's Private Pass program. For complete pre-sale details visit www.citiprivatepass.com. Check out the full "Love Alive" itinerary below. For more information, head over to Heart-Music.com.